Tale of Us have revealed that they will take their Afterlife concept party to Miami on Saturday 3rd December, for an event that will take place during the city’s Art Basel festival. 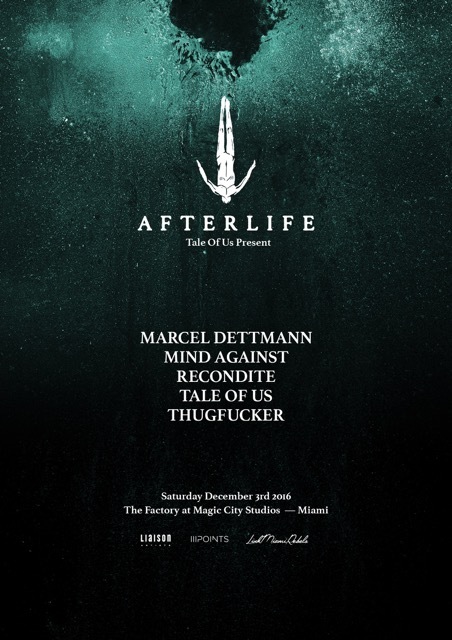 Their inaugural Afterlife event in North America will hit Magic City Warehouse, with a line-up that features Marcel Dettmann, Mind Against, Recondite and Thugfucker, as well as the Italian-born, Berlin-based duo. Having launched their Afterlife concept in Barcelona back in June, Tale Of Us’ 13-week residency at Space Ibiza has made a name for itself as one of the coolest parties on the island. After welcoming pals Dixon, Recondite and Rødhåd to the decks on the White Isle, last month (August) Tale Of Us revealed that they will also take Afterlife to London — kicking off at Shoreditch rave cave Village Underground on Friday 11th and Saturday 12th November. You can read our interview with Tale Of Us from DJ Mag Ibiza here, watch them spin at week nine of their Afterlife Space residency from earlier this month (September) below, and see full details of the Miami party underneath that.